It's that time of year where the chill has officially set in the air. No more going outside without a jacket, and for me that also means my indoor uniform has changed. When I refer to my indoor uniform, I'm talking about what I can typically be found sporting around the house. Because if I don't have to be at work, or out and about, I'm all about being as warm and comfy as possible. 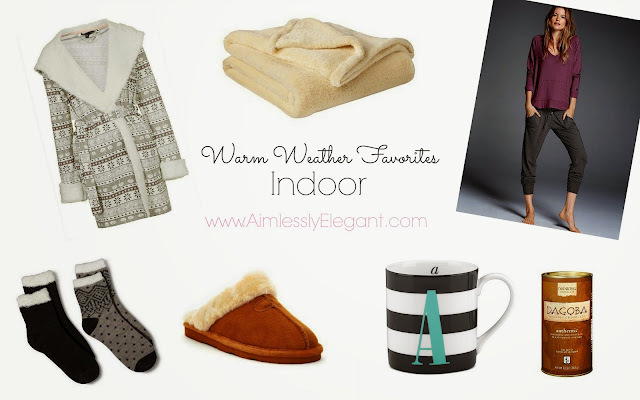 Today I've rounded up my indoor warm weather favorites. When I'm at home some super comfy lounge clothes are always in order, those are the foundation of any great warm weather outfit. Layer on top of that some fuzzy socks, and if it's extra chilly a plush robe. This time of year I wear my slippers everywhere in the house. I've had these exact slippers for the last few years and I love them. I have gone through a few pairs, and I'm sure when they wear out I will get another. I love that they are soft and fuzzy, but they have a real sole on them so I'm not sliding all over the place like I would otherwise. If I am sitting down you can for sure find me under a blanket, those super soft fuzzy ones are my absolute favorite. That pretty much goes for me year round, though this time of year you can typically find me cuddle under not one, but usually many blankets. Another staple this time of year, a great mug with a warm beverage inside. You can never go wrong with hot chocolate, it's perfect for those cold dreary days like we are having today! Do you have any warm weather favorites? Love the mug and those slippers! So cozy! All of these look so cozy! Love that throw. They are a must! They are on my feet non stop! Cozy is the key, you can never go wrong with a great throw!